Note: While writing this monster of a post I realized I wrote a post back in August of 2008 wherein I dreamed up a double-feature bava beverly film fest that matched a Bava film with another classic. Well this is me finally making good on at least half of that film festival. Funny how the blog is a spiral that I am able to return to my ideas from more than five years ago as if they were brand new. That is a very cool thing. 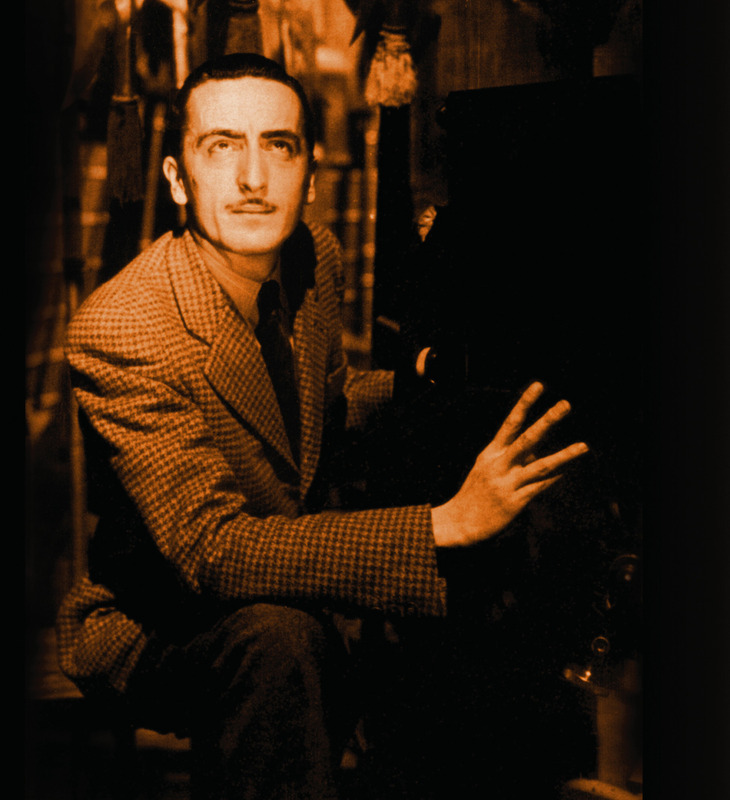 I tweeted a couple of days ago about the fact that there are at least 13 16 Mario Bava films streaming on Netflix right now in the U.S.¹ That’s pretty impressive, especially given he directed 32 films—that’s precisely half his oeuvre. Now I’d like to say just the “good ones” are on Netflix, but starting down the path of good and bad Bava films misses the point of his art. My fascination with Mario Bava as a filmmaker is not so much about some nebulous sense of genius people throw out there when they can’t make a precise point, rather for me it’s his ability to do so much cinematically with so little. He regularly worked on a shoestring budget, but managed to create an aesthetic that simultaneously reaffirms and transcends the b-movie world within which he worked. Tim Lucas, author of Mario Bava: All the Colors of the Dark, describes Bava’s approach well when discussing one of his last films Rabid Dogs (1974), “a minimalist noir masterpiece that shows how much drama he was capable of conjuring onscreen with little or no means.” He’s been referred to as the “Italian Hitchcock,” and while I think there is some validity to the comparison it ultimately sets the would-be viewer up for disappointment. 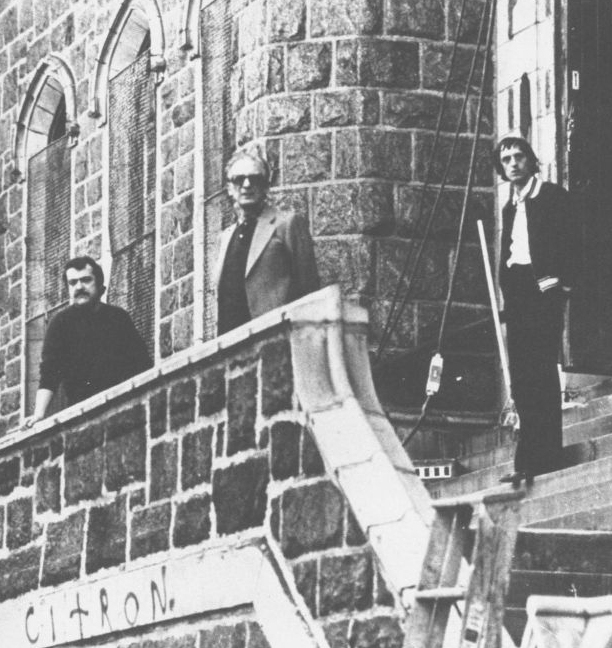 Bava is a b-movie maker, that needs to be understood as part of his “genius”—it can’t be explained away as an unfortunate limitation he could have overcome with bigger budgets. He might just as easily been a terrible director with more money and the concomitant pressure within the Hollywood system. Bava’s films should not be sullied with “what ifs” and “buts,” but taken for what they are, because they’re that good in their own right. 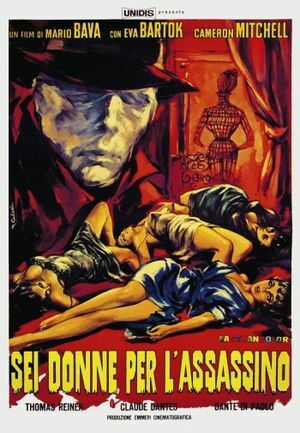 One might also describe Bava as the “Italian Kubrik” given how Bava worked across numerous b-movie genres, doing everything from horror to Sword-and-Sandal to Westerns to Monster flicks to Gialli to fumetti to proto-types for the Slasher and 70s violent realism/noir. What’s more, he focused far more on the aesthetic than the acting, and the two share that focus to some great extent. He had a wide ranging talent, and his experimentation and exploration seem to have been fueled by doing more with less and remaining intentionally outside the Hollywood system—which might have been his greatest decision as filmmaker given how kind film history and criticism are proving to be to his career in retrospect. He gave filmmakers like Dario Argento and Lucio Fulci their vision to some great degree, and in many ways made way for the Italian gore fest that was to follow in the 70s and 80s, but both often lack the sensuousness of Bava’s films. In my mind Bava is the source of it all: the godfather of Italian horror, the Gialli, more contemporary sub genres like the slasher, and mor. He’s the one because he was experimenting wildly on a shoestring budget and refused to leave that path. Were all his films great? No. Was his vision always consistent? No. But he provides a barebones operation like bavatuesdays the energy to keep experimenting and creating without worrying about visions of “genius.” Genius is the term people label you with when they want to render you toothless. OK, all that to get to this. 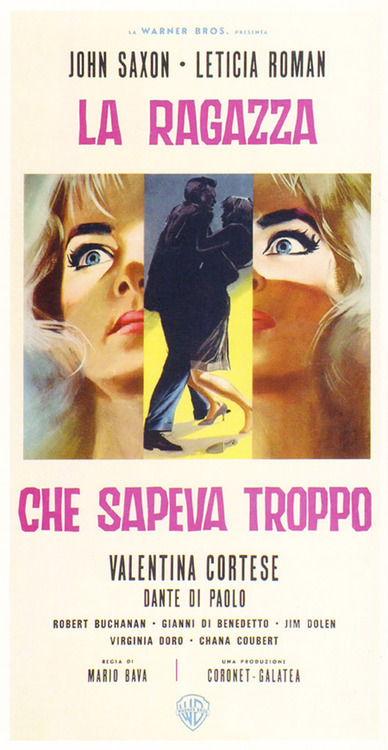 I was thinking why not do a ten-week series every Tuesday from April 2nd through June 4th wherein I focus on at least one film by Mario Bava. All but two of these films will be available through Netflix, and for those without Netflix—we are currently working on other ways of sharing these films 🙂 So, I have come up with a schedule and a list of films that I will be researching, blogging, and producing a live hour long video episode to analyze the film of that week. I’ll also see I can’t bring in other people to discuss the work. I’ll invite anyone to play along, but I’d like to think of this more like a distributed festival than a course—-especially given my love affair with Mario Bava was sealed by just such an event at the Brooklyn Academy of Music’s Rose Cinema in 2001, or was it 2002? Either way, I still do have a copy of the schedule for good measure (fruit of an archival post from long ago). A gothic horror about a witch who is executed by her brother only to return 200 years later to exact revenge on her descendents. This is Bava’s most popular film, and with good reason—it is a brilliant homage to James Whale’s monster films of the 1930s, and black and white has never looked so good. 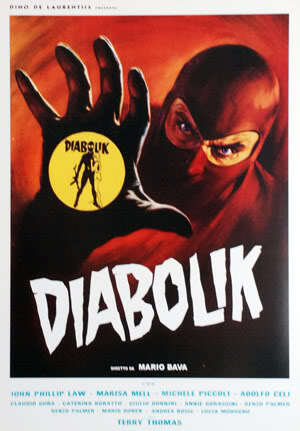 It’s a great film to start off with, but I don’t think a Bava film is ever this polished again, although Danger Diabolik is pretty gorgeous from beginning to end as well.) Despite the polish, Black Sunday is pretty explicit visually, and as a result was banned in the UK and re-edited in the U.S.
A 1961 Italian sword-and-sandal film, it stars British bodybuilderReg Park as Hercules and legendary British actor Christopher Lee as his nemesis, Lico. It is the sequel to Hercules and the Captive Women. 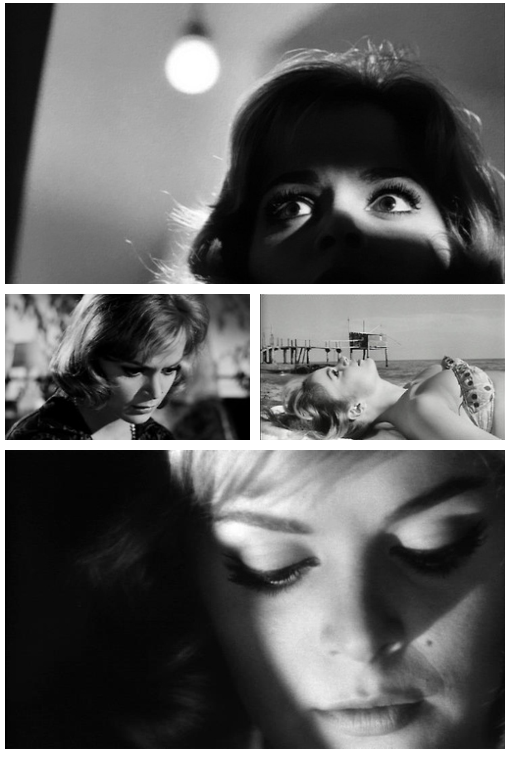 It is one of the most appreciated films of its genre, with Bava’s direction and atmospheric sets elevating the film above the usual cheap standards. 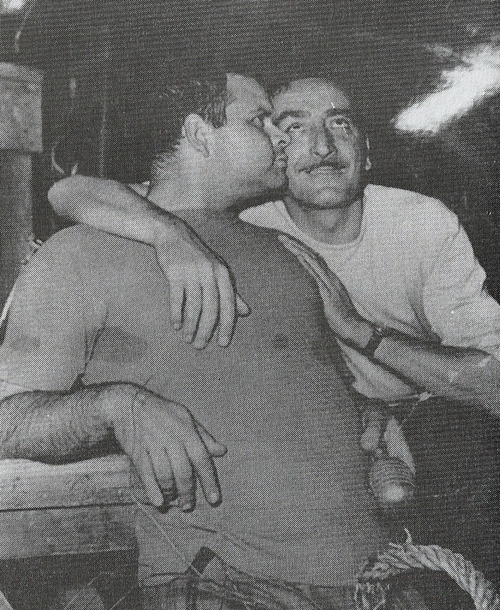 It will be fun to talk about the whole idea of Bava’s aesthetic in relationship to genre filmmaking, budgets, and the state of the Italian film industry in the 1960s. I love this film for a variety of reasons, but none more than how much Bava does to create ambience and a sense of wonder with so very little. The story concerns the stalking and brutal murders of various scantily-clad fashion models, committed by a masked killer in a desperate attempt to obtain a scandal-revealing diary. 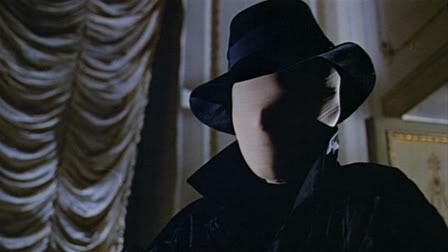 The film is generally considered one of the earliest and most influential of all giallo films, and served as a stylistic template for the “body count” slasher films of the 1980s. Tim Lucas has noted that the film has “gone on to inspire legions of contemporary filmmakers, from Dario Argento to Martin Scorsese to Quentin Tarantino.” In 2004, one of its sequences was voted No. 85 in “The 100 Scariest Movie Moments” by the Bravo TV network. Black Sabbath (Italian: I tre volti della paura (The Three Faces of Fear)) is a 1963 Italian horroranthology film directed by Mario Bava. The film comprises three horror stories: “The Wurdulak” (based on the novella The Family of the Vourdalak by Aleksey Konstantinovich Tolstoy, and starring Boris Karloff), “The Drop of Water” and “The Telephone”. The heavy metal band Black Sabbath appropriated their name from the British title of the film. I’m fascinated by the idea of several short films within a film, and the relationship their order and organizations plays to plot and theme, just like with a good book of short stories. The American version of Black Sabbath was expurgated and reorganized, basically removing the Lesbian relationship from the Telephone episode, toning down the violence, and re-ordering the sequence of the films. Which, for many, kills the effect of the three films. I haven’t seen the Italian version yet, so we’ll be examining both to get a sense of how often these films were randomly re-edited and cut due to content matter. A kind of textual history of b-movies in the 1960s. Additionally, I think this is the first of its kind in terms of three-in-one horror films. The anthology horror approach became a bit more popular in the 70s and 80s with Trilogy of Terror (1975), Creepshow (1982), and Cat’s Eye (1985). In a turn-of-the-century Carpathian village a series of murders are occurring in which the victims are found with silver coins embedded in their hearts. The coins are revealed to be talismans placed on the victims by the town witch (Fabienne Dali), meant to ward off the supernatural powers of the aged Baroness Graps (Giana Vivaldi). The baroness has been performing these duties for the ghost of her murdered daughter, who wants to claim the villagers’ souls. In order to free the village from the curse, Dali must find the sequestered baroness and destroy her. This is the film Scorsese regards as Bava’s masterpiece, and it for many epitomizes the less is more philosophy of his filmmaking. Like Blood and Black Lace, Twitch of the Death Nerve is placed squarely in the lineage of proto-Slasher films, and the lake/camp setting and inscrutable plot makes its scenic/aesthetic influence that much clearer. THis may be Bava’s most influential and imitated film, featuring thirteen fairly inventive and grisly murders, and it reads like a roadmap for late 70s, early 80s slasher films like Halloween, Friday the 13th, and many, many others. In fact, Friday the 13th, part 2, copied two of the murder sequences shot-for-shot. 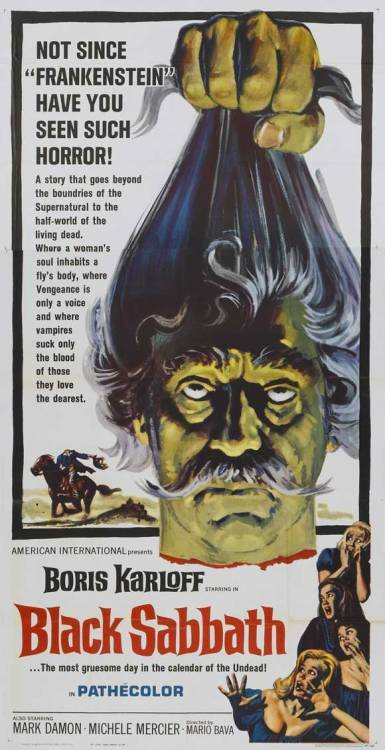 When the film was picked up for U.S. distribution by exploitation specialists Hallmark Releasing Corporation, they titled the film Carnage and copied their own successful advertising campaign for Mark of the Devil by proclaiming that Bava’s film was “The Second Film Rated ‘V’ for Violence!” (Devil having been the first). The movie was apparently unsuccessful, and it was withdrawn and re-released in 1972 under its most commonly known title, Twitch of the Death Nerve. It reportedly played for years under this title in drive-ins and grindhouses throughout the country. 1. 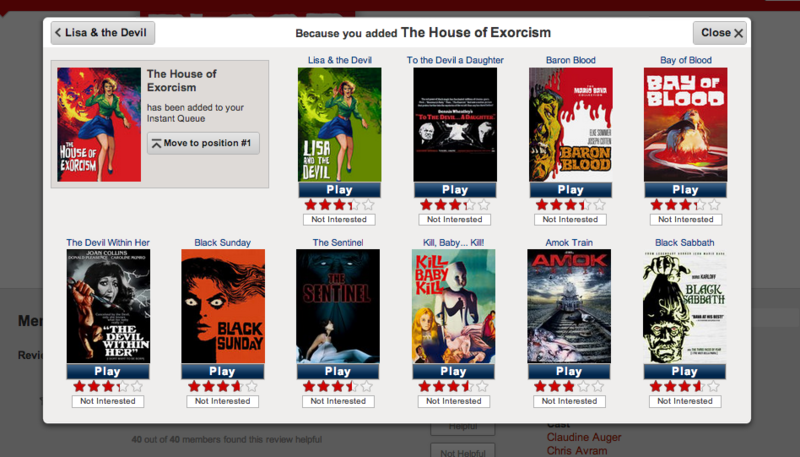 Bava’s films seem to be only available to U.S. subscribers on Netflix. But never fear my international friends, you have options: can you find a U.S. proxy connection, or manually change your DNS settings to a US DNS numbers—many of which are available online. Also, if you want a simpler solution try the Hola Unblocker extension for Chrome which gives you access in other countries (thanks Andrea). 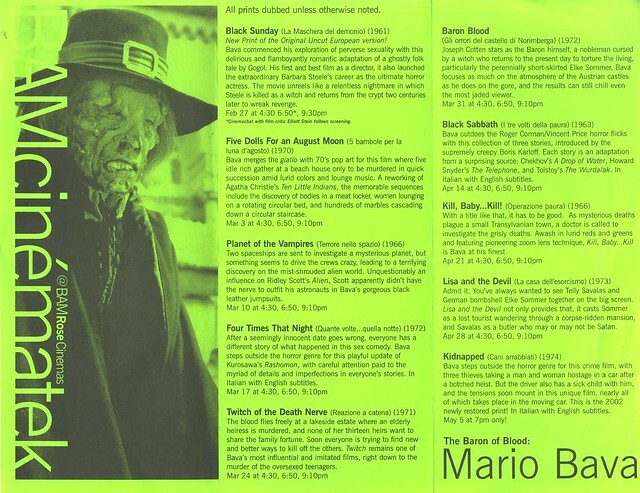 This entry was posted in bavatuesdays, Movie Lists, movies and tagged bavatuesdays, horror, mario bava, movies. Bookmark the permalink. Well, this should be both entertaining and educational. I must confess that, until now, the only Bava that I have had any awareness of is of the Jim Groom variety. Sorry, Jim, but my experience with the Mario Bava kind of Bava has been severely lacking, and thus I very much look forward to this ten-week exploration. In scanning over Bava’s Filmography, I don’t see many titles with which I am familiar. I will put that down to a wholesome, small-town upbringing, where access to b-grade movies was limited to the local drive-in — and while Bava was being prolific, I wasn’t old enough to drive. I can lay claim to having seen at least one of the Dr. Goldfoot films (although it may have been the first one, directed by Norman Taurog, and not the sequel, directed by Mario Bava). Revisiting that memory now, long after having seen the fembot opening sequence of the second Austin Powers film, shows how nested and antecedential some of these films are. Let the Bava on Bava fest begin! I so need to be part of this. 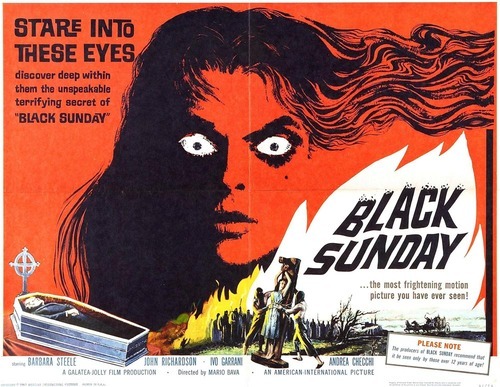 Black Sunday changed my life. Planet of the Vampires was the first Bava I saw, too. Scared the hell out of me – I was about 6 or 7 years old. 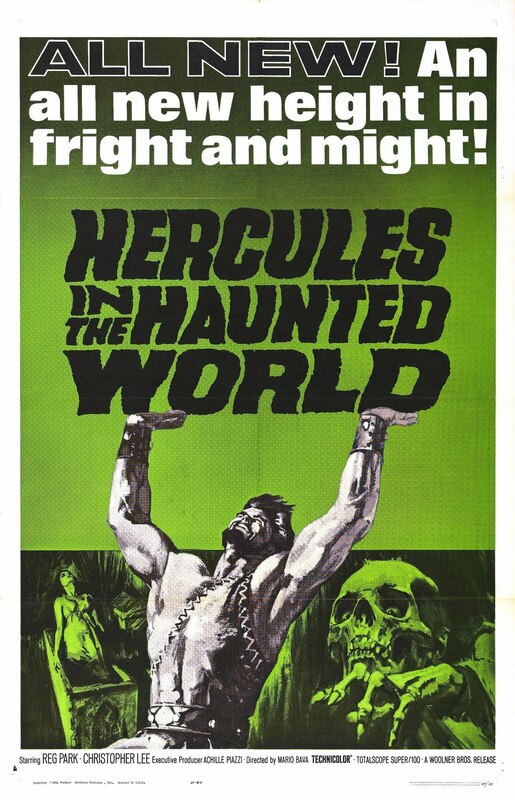 You might want to check the quality of Hercules and the Haunted World before things kick off. The last time I tried to watch it on Netflix streaming I remember washed-out colors and issues with sound quality, but they might have fixed that. Good call, if they are bad versions I’ll see if i can;t find a space that people can stream higher quality versions. We’ve been experimenting with just that these days at UMW, and it might be a good test case. Interestingly enough, someone else via email was interested in the Dr. Goldfoot Bava film, I’m not ruling it out, but damn it’s bad 😉 Bava is an interesting filmmaker, and he challenges you to look beyond the entirety of a film to the fragmentary elements of its imagination—not unlike Kafka. I came to him late myself, i was in my late 20s when I discovered Planet of the Vampires on DVD, then two years later came across an entire retrospective in Brooklyn that sealed the love affair for me 🙂 I am particularly fired up you will be playing along because I am loving the GIfs you have been doing for the last 6 months, and even if a little of that goodness translates into bava play, then it is already worth the while! I think I would have been freaked out by the whole first 10 minutes of Planet of the Vampires based on how crazy the pacing and gravity scene is. What an amazing example of Bava doing a ton with so little. The space suits, they space suits, I love them so much! As for Kill, Baby, Kill and Rabid Dogs, you will not be let down. 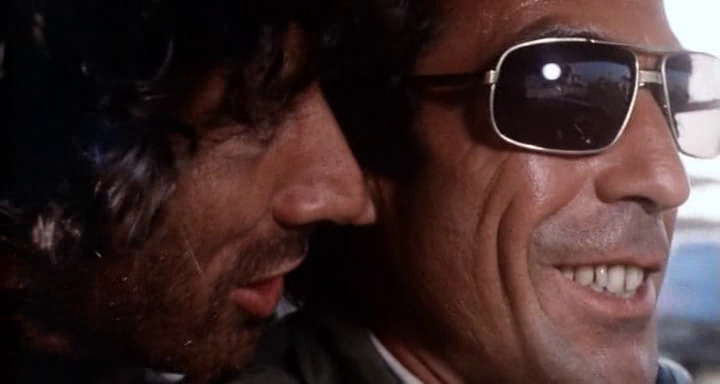 And Rabid Dogs may be one of the hardest films I have ever watched. Man, I am getting excited just thinking about all of you playing along, you rule!